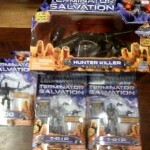 Thanks to DevilDawg for posting up new images of Terminator Salvation Toys purchased at US Retail in Tennessee. For those of you who are going to collect this line Happy Hunting! To view the new Terminator Salvations images click the Title Bar. New TERMINATOR SALVATIONS 10 Inch and 6 Inch Movie Action Figure images are now up for your viewing pleasure. The new Terminator action figures include. To view the new TERMINATOR Images click the Title Bar. 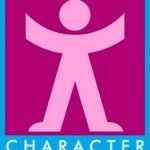 Character Options has announced a bunch of new products to launch alongside the Terminator: Salvation film. 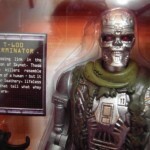 Character Options is preparing for a launch of action figures and gadgets to accompany latest Terminator movie. The firm has introduced 3.75″, 7″ and 10″ action figures of all the main characters from the film including John Connor, the range of T600 – 800s and the new stranger Marcus Wright. Further items in the collection will be the Terminator Voice Change Mask and other role-play gadgets to mirror the chaotic world of 2018. Jerry Healy, marketing director of Character Options said: “Terminator Salvation represents an excellent opportunity for Character. The initial three films have cult status and this new film looks to be no different. The Terminator collectables have a consumer sale in June to coincide with the movie launch but are available to order now. 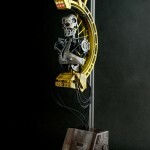 Sideshow has announced that they will be carrying the amazing Hot Toys Terminator: Salvation T-700 Factory Diorama. The diorama is set for release sometime in the second quart of this year. Sideshow Collectibles and Hot Toys are proud to bring you the first piece in the Hot Toys Terminator Salvation lineup – the Terminator Factory: T-700 Diorama. This diorama captures the T-700 assembly line building an army of cyborgs. True to 1:6th scale, the T-700 Diorama stands approximately 15 inches high and features light-up eyes and a light-up button on the manufacturing machine. Each diorama base features a Terminator Salvation logo. 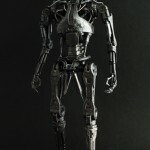 Hot Toys has put up some great new images and info for their upcoming Terminator: Salvation inspired T-600 & T-700 figures. Watch out! 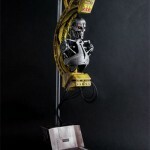 The T4 – TERMINATORS will invade Hot Toys! – Only 3 months left, the most anticipated Sci-fi movie in 2009 will be up! Before then, Hot Toys is gonna bring you the first wave of collectibles from the MMS series. They are the 12″ high T-700 Endoskeleton collectible figure and 14″ high T-600 Endoskeleton collectible figure, both figurines are perfectly in 1/6th scale, feature eyes light-up function, and come along with a movie scene featured figure base. Here’s some information related to the terminators which you may interested: T-700 are killing machines move in armies to wipe out resistance hold outs. This machine is sleeker, faster and smarter than the T-600. T-600 carry artillery sized weapons and have only one purpose; Terminate all human beings! If you want to know more, stick around at hottoys.com.hk! More 1/6th scale collectibles will debut before May, 2009. The T-600 can be seen Here. The T-700 can be seen Here. Hot Toys has just announced a new diorama. It is based on the T-700 Terminators from the upcoming film, Terminator: Salvation. No price is yet listed. This diorama captures T700 in assembly line at the Terminator factory. It’s true to 1/6th scale and approximately stands 15 inches / 40 cm tall, featuring T700 light up eyes and light up button on manufacturing machine. Each diorama featuring a Terminator Salvation logo base. Collect more to build up the Terminator factory! We have mirrored the images. Click the headline of the story for photos. See the original product listing Here. Terminator: Salvation 3-3/4" Figures & Vehicle! 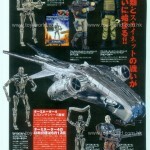 Figure King shows images of the upcoming Terminator: Salvation 3-3/4″ scale figures and vehicle! These include the T-R.I.P., T-700, T-600, & more! We also get a look at the packaging for these figures.